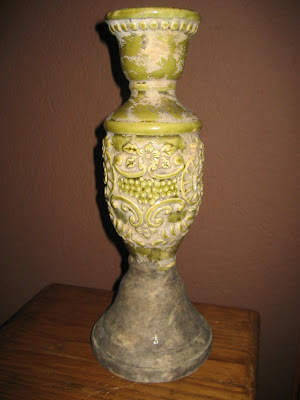 Isn't this candlestick beautiful? I looked all around for a twin or a vase or some other family member. No luck. I like the idea of collecting them...but, my bet is that they will end up at the store. I just amazes me what people get rid of! It is true what they say...one person's trash is another person's treasure! You truly found yourself a treasure! I've seen a picture of one of those heads wearing a wig and sitting on a shelf. I don't it that is its proper use, but that's what I know. Oh! Mindy I love that candlestick! It's so French Country and Old World Style...love it!!! That candlestick is gorgeous! 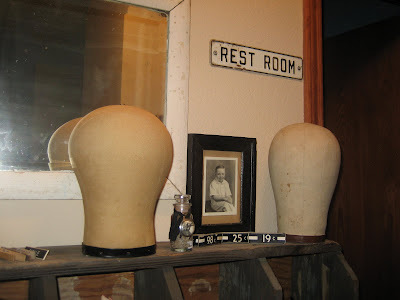 I think I remember my cousin having some heads like that way back when to hold her wigs - I think she called them "falls" (just the back part), brings back some giggles. I'm sure they'll look wonderful wherever where home ends up being - haven't seen them forever! I think they are for pinning a hairpiece to when you aren't wearing it. So that it doesn't get smushed or something. I have also seen some that are made of styrofoam. There are great big 3" long "T" shaped pins that go in them. Do I sound like I know what I'm talking about? Either that or they're Nerf cannonballs. So that you can shoot your cannon in the house without mom getting mad. One or the other, definitely! Here is the styrofoam modern version. Wow! Love the heads, too! I find myself collecting more hands and doll parts! 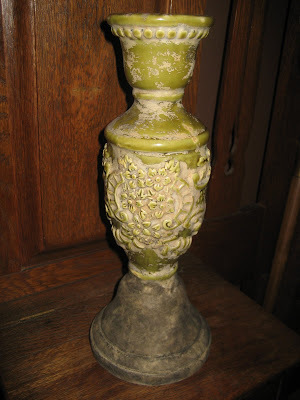 I dont know if the candlestick needs a mate. It so amazing on its own....next to a plant in the spring? Maybe a cactus of somesort? Great finds. I started thrifting again and have been having a blast. I missed it. Sandy - The Tattered House. Oh I love those cloth heads too! I think they're for wigs also but they sure display jewelry and hats nicely. I would love to find a child sized display head - if you ever come across one!!! OK, those heads are very cool, as is that shelf that they're on. 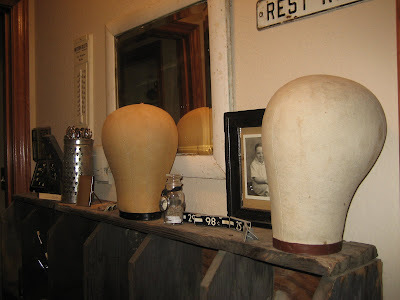 You need you a couple vintage hats to display on those heads.